I picked up wargames Soldiers & Strategy issue 70 the other day. On page 34 there is an article on using Dan Merseys Dux Bellorum dark ages rules for ancient games by Allen E Curtis. 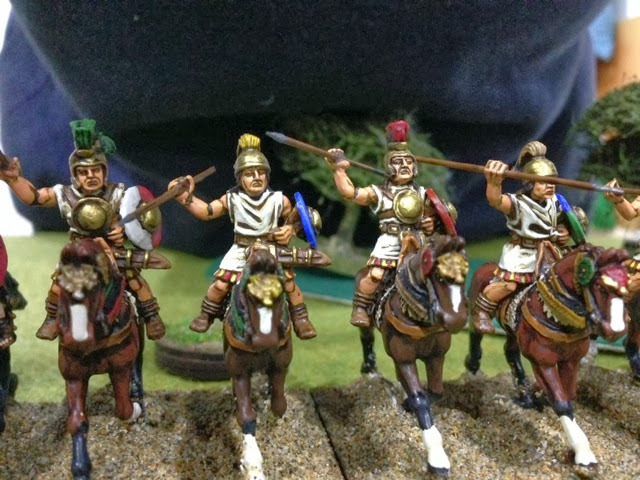 I have had a number of excellent games using these rules for their intended period so I thought I would give them a try with Ancients. I set up a 6x5 table with figures representing Syracusans and Spanish from the mid 3rd century BCE. This a view of the Spanish line. I started by taking the standard troop types from the book.